This elegant new luggage line by Rimowa is the result of the consistent further development of the successful Salsa series, and only for this reason, it embodies toughness in itself. Each case is nearly indestructible and fully featured. 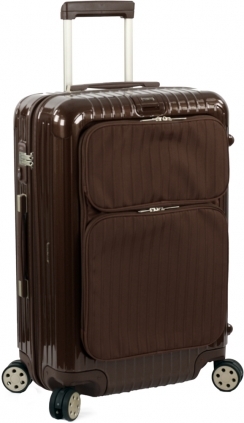 This clever, stylish case combines the best of both worlds: hardside and softside luggage. The convenient front pockets can accommodate IPad, Laptop, magazines, tickets and more. We most of the Salsa Deluxe collection in four fashionable colors: Black, Brown, Oriental Red, and Yachting Blue. We stock the Salsa Deluxe collection in three fashionable colors: Black, Brown (shown) and Oriental Red. In the Inside, there's 2 flex dividers for separate, wrinkle free packing. This case is great for a weekend of travel.